Of Gifts and Hobbies – Must. Write. Or else. 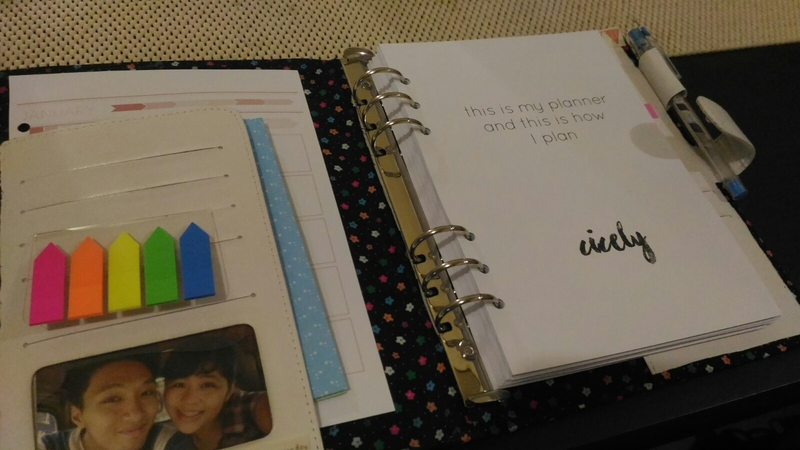 My DIY planner -- an old Usana binder covered with cloth and inserts I printed (both self-made and from online craftees). I love notebooks! Journals, diaries, organizers, planners, notepads and colorful pens make me super happy — the same happiness and kilig ice cream gives me! I guess whatever we want to receive on our special days all comes down to one thing – our hobbies. So back to what I was saying. We usually classify people according to their looks, their brains, and even their upbringings, but we can’t judge them for what they do in their secret times and places. For me, hobbies define the heart of a person – the inner personality only he/she and God know, and whatever gift we always look forward to on our birthday and at Christmas only reflects our values and belief system – who we are when no one’s looking and how we view ourselves in relation to the world and life itself. Since forever I’ve thought of myself as a poet, a playwright, a female Shakespeare clothed in thick adipose tissue. If I had to express myself, I would gladly do so in writing — in poetry more often. I couldn’t imagine my life without words written by my calloused fingers. The funny thing, though, is when I receive a journal or a notebook that I actually terribly like, I don’t use it just yet. I keep it on display until I grow tired of poring over it and admiring its pages. Until a new and fancier one arrives, I wouldn’t be using my beloved journal for just any writing. It should contain my best works, my best poems or stories. This was the case until September 30, 2011. I didn’t have spare money to buy a new devotional journal, but I had all those cute diaries from Korea and Taiwan that I didn’t want to use for JUST any writing. I had them for display! Then came the voice of thunder. Yeah, God spoke to me about my pretty journals. God gave His best for me. What is a notebook compared to Jesus? I know – a speck of dust in a palace of pure, untarnished gold. I doubt if it has any purpose at all. If I don’t give my best and all the best gifts I have received to God, do I have a right to claim the perfect Gift of all as my own? Not a chance.